EUGENE, OR. — Sharps Bros., a firearm design and manufacturing company, has announced price reductions to the Gen2 versions of their popular Hellbreaker, Warthog, The Jack and Overthrow AR15 receivers. They have also announced an expanded lineup that includes competitively priced handguards, built lower receivers, builder sets and 80% receivers. 3 new MLOK hand guard lengths have been added to the lineup (bringing total to 4 hand guard SKUs). Sharps Bros. now has 7″, 10″, 13.7″ and 15″ offerings. These hand guards are very well made, very clean designs and are extremely price competitive. Availability of the new lengths is expected in January. Built lower receivers is currently a purchase option through Rainier Arms, and will become a purchase option through their other distribution partners in January. Sharps Bros will also offer a builder set that comes with the receiver of your choice, their AR15 upper and the SBHG01 (13.7″) MLOK Hand Guard. The Jack 80% receivers are currently available through Rainier Arms. Over the next few months they will add Hellbreaker, Warthog and Overthrow to the 80% lineup. Sharps Bros. AR receivers are milled from solid blocks of 7075-T6 aluminum. Advanced machining capabilities and hands-on craftsmanship ensures that every design is not only precisely detailed and visually distinctive, but superior in quality and capabilities. 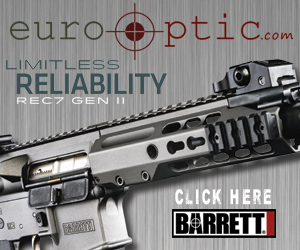 Gen2 receivers are available now at the new pricing to consumers and FFL holders through Rainier Arms, RSR Group and Zanders Sporting Goods – all leading distributors of AR15 rifles and accessories. Sharps Bros. products include The Jack, featuring a skull design; Warthog, featuring a boar’s head design; and Hellbreaker, an iconic design inspired by the P-40 Warhawk. Follow Sharps Bros. on Instagram (http://instagram.com/sharpsbros) or Facebook (https://www.facebook.com/sharpsbros) for company news and product updates. Amazon truly has just about everything from A to Z. Granted, they do not possess a FFL (that we are aware of), but that does not stop them from selling gun-related items. On a journey to find all things obscurely gun related, Amazon was the obvious choice due to sheer variety. Here are Fifteen Ridiculous Products for Gun Owners that were found to be either ridiculously good or ridiculously bad, we are not sure, nor will we judge anyone who decides to include one of these items into their daily lives. that it will be releasing the BAD-MRB (Magazine Release Block) – CA Compliant Fixed Magazine on December 1st, 2017. After months of anticipation the new CA Compliant Fixed Magazine service will be available at BATTLEARMS website. This will be the first of services provided online via a Conversion Work Order Form right at the BATTLEARMS services page (http://www.battlearmsdevelopment.com/services/). This page will include details with a video demonstration, options and what is and not included in the service. May 26, 2017: The ETS Group is proud to announce the release of their new line of 42 and 43 Glock® clear polymer magazine models. All ETS Glock® 42 and 43 magazine models are single stack and each standard model holds 7 rounds, as opposed to the 6 rounds standard Glock® factory magazines hold. Also available are ETS’s 9 and 12 round versions, an industry first! ETS’s GLK-42-9 and GLK-43-9 models are only .75 inches longer than the standard 7-round magazine and allow for a better grip and control of the handgun. ETS’s clear polymer magazines feature extreme impact resistance so they won’t crack when dropped. The durable construction ensures the feed lips won’t spread when fully loaded and stored. ETS’s full line of 42 and 43 models are available now at www.etsgroup.us. Tyrant Designs CNC, coming off an impressive product launch that sold out everywhere within 72 hours, Tyrant has now released the MiniVert in Red, Grey and Blue. The early reviews have come back very positive, with the guys at Tyrant already shifting their focus onto their upcoming Hand Stop. Tyrant Designs CNC, an industry leader in high-end aftermarket AR grips has just announced their release of the new HALO Series MiniVert, a vertical forward grip. With dimensions slightly smaller than the average AR-15 vert grip, the MiniVert sports an aggressive looking knurl and well thought out ergonomics. Coupled with the ability to fit directly to MLOK and Keymod rail systems this little grip packs a big punch. With an overall length just shy of 3 inches, Tyrant instead utilized an elongated lip at the bottom allowing the operator the option of either tucking their pinky behind or resting the finger the traditional way. Tyrant Designs CNC is an AR accessories manufacturer based just outside of Chicago. They have had several successful designs for AR pistol grips and are now working on a unique styled hand stop. Every once and awhile I will come across a product that stops me in my tracks and has me put it in reverse. Yesterday at the SHOT Industry Day at the Range, the Mag Pump did just that. Though I had just casually passed by their booth which was tucked away in the corner in “tent village”, it was not until I had actually seen it being used to load magazines at the Aero Precision live fire lane that it had caught my attention. The Mag Pump is a hopper-fed, loose ammo loader for .223 Rem, 5.56 NATO and .300 BLK and is compatible with all MIL-SPEC AR-15 Magazines and is available in both polymer or machined aluminum. So, down to the nuts and bolts. The Mag Pump is capable of being table mounted via two pre-drilled holes on the base which will provide it greater stability, though it is not required. Basic operation consists of the user placing a MIL-SPEC AR15 magazine, tip down, into the front of the Mag Pump and dumping a handful of ammo in the hopper. Though all of the rounds will need to be oriented horizontally in the hopper, it does not matter which direction the bullet tip or primer is facing. Once the user has loaded up to 90 rounds into the hopper, all that is required is a pumping motion on the side lever, which a child could do with ease. Another nice feature, no counting. Once the magazine has reached its capacity, the Mag Pump recognizes through a sensor that the tension on the spring has reached the capacity and it will no longer allow rounds to be inserted. The Mag Pump MSRP’s for $199 for the polymer version (MP-AR15) and $399 for the machined aluminum (MP-AR15 ELITE). If you are an occasional shooter that is only loading a magazine or two once in a while, this product may not be for you. If you are a higher volume shooter, or someone who teaches or attends classes where down time between shooting for loading magazines can be a hinderance, this is definitely something you need to take a closer look at. There are also versions coming soon for the AK47 as well as Glock 9mm magazines. Mag Pump does not have their own booth at the SHOT Show, however, they will have some on display in booth 6112 this week. I will attempt to get a video of it in action. For more information, please visit magpump.com or email them directly at orders@magpump.com. For more information, please visit the Black Rhino Concealment webpage.